Here's to your health and happiness in the coming decade--live long and prosper! Coming soon: Healthy Foodie (non-) resolutions -- How this year will be our best EVER. Out to see "Avatar" in 3D and stadium seating, we stopped at Pappadeaux for dinner. My husband had never eaten there & I had been only once or twice at an outpost in Atlanta. My husband liked the buzz of the place and pronounced this restaurant "fun." One thing we could not help but notice was the preponderance of truly large people in there. I'm talking the obese and the morbidly obese, with a few overweight folks thrown in. You really don't see much of that in the city places we frequent. But that's real America these days, for sure. 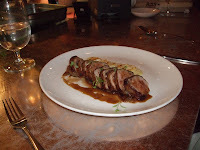 The food definitely was tasty, the prices quite reasonable, and we managed not to overeat. He started with a real deal on oysters -- 6 large ones with all the proper trimmings for only $2.95. 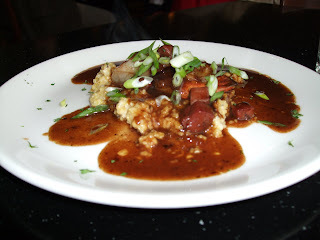 I had a cup of very flavorful seafood and sausage gumbo. 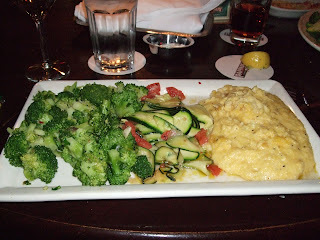 For entrees, he had a salmon dish (small portion) with dirty rice, while I went with a made-up veggie plate of three sides: steamed broccoli (no sauce), sauteed zucchini ribbons and the sinful cheese grits. I was able to leave about half the grits behind--they were delish. He had a beer and I had a glass of sauvignon blanc, and the bill hit about $50, plus a tip. 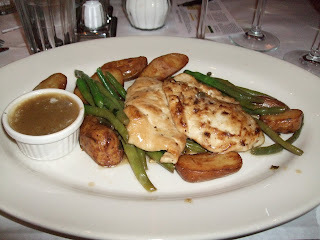 After Christmas, we took our visiting family to Palomino's overlooking Fountain Square. With a view of the skating rink and the decorated square, it's a fun place to dine with out-of-towners. 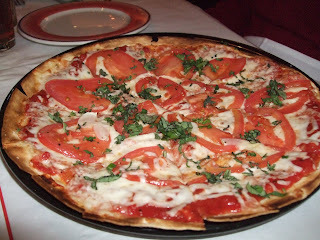 The food is passable--our meals included chicken piccata, a swordfish dish and a tasty thin-crust fresh tomato and cheese pizza. 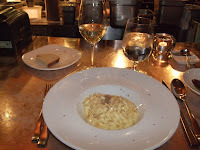 My nephew also had a very, very rich lobster ravioli with an Alfredo sauce--too unhealthy even to photograph! It's an old-South tradition to eat black-eyed peas on New Year's Day, for luck, and therefore you can occasionally find fresh black-eyed peas around this time of year. I've seen it at Keller's IGA in Clifton some years--haven't looked yet for this New Year's Day meal. Even if you must use frozen peas, try this recipe for NY Day. We like to have it with steamed rice and crusty bread. Cook the peas in boiling water until just tended, about 10 minutes. Drain well. Heat 2 T of the oil in the same pan. Add the fennel, onion and fennel seeds, cooking over moderate heat, stirring, until lightly browned, about 15 minutes. Add the peas, Swiss chard or other greens, tomatoes and water. Cover partially and cook over medium-low heat, stirring occasionally, until the peas are tender, about 20 minutes. Transfer to a deep bowl and drizzle the remaining olive oil over the top. 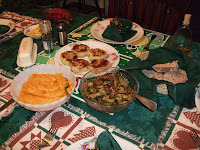 Crab cakes (and one salmon cake for my husband, his preference)....Brussels sprouts steamed then sliced and sauteed with pancetta and diced carrots....pureed butternut squash with ginger, cinnamon, cumin and truffled honey (that's honey with a truffle in it, brought back from Italy)... sliced whole grain bread. The Cincinnati branch of our family--my husband, George; my mom, Wilma; our daughter, Kristina and her new (5/09) husband, Christopher; and me. Candlelight service @ 5:30 PM at Immanuel Presbyterian in Clifton, home for summer, then exchange of gifts. Donna Phelps used to sell her wonderful treats on Saturdays at Findlay Market, but then her reputation for the best chocolate-chip cookies outgrew her ability to bake at home or even in a gigantic church kitchen in Hyde Park. 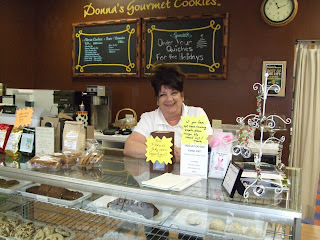 About a year ago, she opened the shop, Donna's Gourmet Cookies, with plenty of oven capacity, off Montgomery Road just inside I-275. She no longer has time to sell at Findlay Market -- the city's loss, for sure -- but you can find her cookies at a few in-town cafes and at Keller's IGA in Clifton, among other places. I'm not a baker and can't really decipher why her cookies are so fabulous, except I know she uses excellent (if not the healthiest) ingredients -- pure butter, real vanilla, and so on. 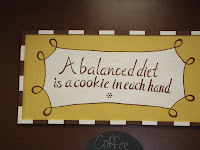 Needless to say, healthy foodies can't quite subscribe to Donna's slogan: "a balanced diet is a cookie in each hand." And we don't indulge in her stuff more than a couple times a year. However, if you want to know whether her cookies (and brownies, bars, croissants and quiches) are worth the calories--that would be a YES. In addition to the stellar chocolate chip, I also love her Snickerdoodles and oatmeal-raisin. Check her website for a full list of what she offers. Her shop is at 10774 Montgomery Road, and the phone number is 489-9600. 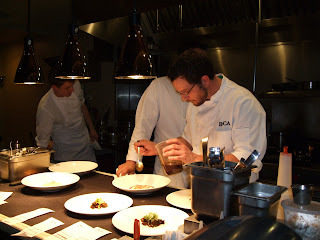 If there's a better place to dine in Greater Cincinnati than BOCA in Oakley, we would love to know about it. But we're pretty sure that this classy and beautiful restaurant is in a league of its own, especially with Maisonette and Pigall's out of the picture. 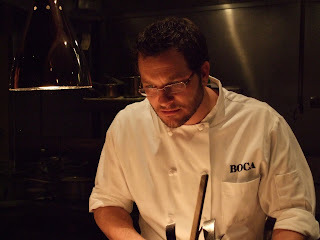 Other talented chefs turn out marvelous food at several places around town, but none can match the sophisticated setting that David Falk and team have pulled off at Boca. 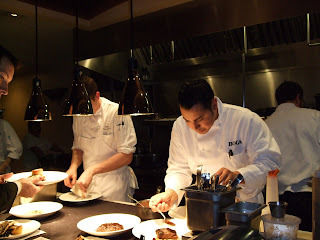 We'd never eaten at the "chef's table" there -- which is a couple of stools at a counter overlooking the open kitchen. Up to four diners can reserve the space, but on this night my husband and I had it to ourselves. 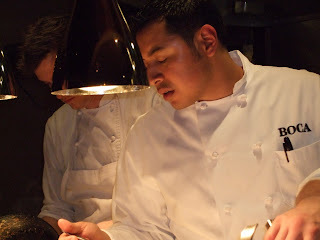 You sit within easy chatting distance from chef de Cuisine Joe Garcia (top photo) and his energetic team as they produce hundreds of perfect plates of food over the course of a few hours. Meanwhile, you get to eat some of the scrumptious stuff and enjoy wines to match each dish. These are the best shots my camera produced of the chefs at work, my husband and I (taken by chef Jim, the one with beard and glasses--thanks, Jim! 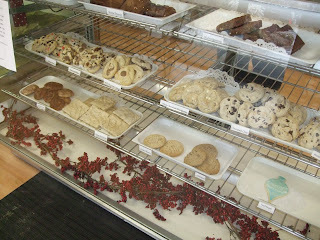 ), and some of our food. 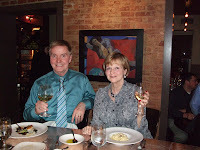 Cliftonites are lucky to have Tink's as a dining choice--it's the most upscale option in the Ludlow Gaslight District. It's where I meet my friend & former co-worker Tricia about every 2 months to catch up over a cocktail at the bar. It's also a reliable spot to take out of town guests, and the best dinner before or after a movie at the Esquire Theater, around the corner. 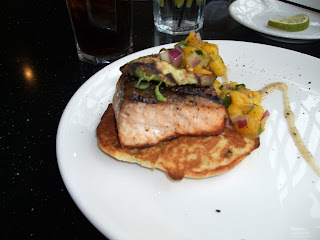 Today I had the grilled salmon over a corn cake, and mom had the shrimp and grits ("best thing on the menu," our waiter enthused). Dark greens are some of the superfoods, so chock-full of antioxidants, vitamins and fiber that they deserve to be on our menus regularly. And now they're easier than ever to cook, thanks to prewashed, prebagged packaging at your corner supermarket. Using a one-pound bag of Trader Joe's "Southern Greens" mix -- collards, kale, spinach and a couple of others -- I made some delicious greens with dinner. 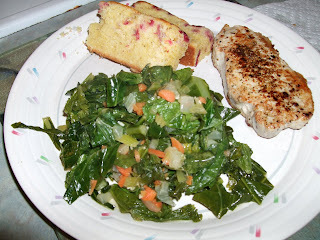 The photo shows them served with slices of cranberry cornbread (from Whole Foods) and a small, pan-fried boneless pork chop. Heat oil in a large skillet over medium-high heat. Add celery, carrots and onions; stir-fry for about 3 minutes. Add garlic and stir-fry for another minute. Reduce heat to medium. Stir in greens, 2 cups at a time, covering pan and allowing each batch to wilt somewhat before adding the next two cups. When all the greens are in, add seasonings and cover the pan again. Reduce heat to low and allow to cook for another 5-10 minutes, depending on the level of doneness you prefer. The earth has provided a few foods that are so marvelous, I think of them as "magic ingredients:" they make just about anything you put them in taste heavenly. 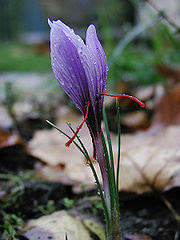 One such fabulous food is the spice, saffron. 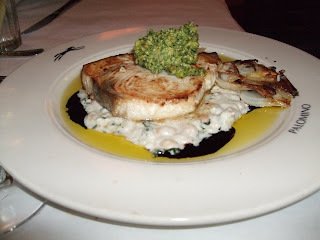 I usually make the following recipe with halibut, but any mild fish will do as well. 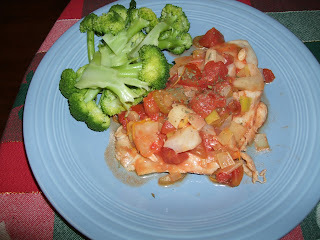 I had tilapia in the freezer, plus all the other ingredients. Voila! Heat oil over medium heat in a large skillet. Add fennel, celery and onions or leeks. Saute, stirring frequently, until vegetables start to become tender and brown a bit (about 4 minutes). Add tomatoes, orange zest and juice, saffron and pepper flakes. Cover and cook 3-4 minutes, until mixture begins to simmer. Add seasonings and water. Cover again and let mixture heat well. Add fish, re-cover, and cook another 5 minutes. Fish is done when it turns white all over. Adjust seasonings, adding more salt if you like. 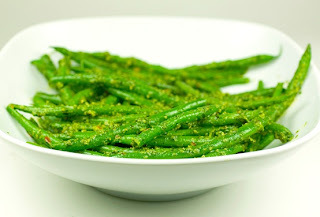 Serve with a green vegetable and crusty bread. A little sauvignon blanc would go great with it, too! This dilemma stretches well past the holiday season: how do we stay fit when it's cold, dark and (worse) icy outdoors? I am a dedicated exercise fanatic, and I'll bundle up and head outdoors even in the coldest weather. But I'm a complete coward about treading on ice. Since winter weather also brings out the cave-man instinct to eat more--storing up calories until the spring--we had better figure out how to burn off the hearty foods we're consuming. Here's my advice for all healthy foodies (including aspiring ones) to consider. 1. Get outdoors, even for short bursts. Put your exercise clothes out at night so first thing in the morning you can jump right into them and out the door. Fifteen minutes in the neighborhood makes a great start to your day. I'll go out saying to myself "just fifteen minutes" but once I've warmed up, that 15 stretches into 20, 30 or more. Do what your schedule will allow, and something is always better than nothing. Add a short walk at lunchtime and another one after work, and you're getting a decent amount total. 2. Join a gym, sign up for Jazzercise classes, get into mall walking -- in short, you do need a backup for times when outdoor exercise is just not an option. At least in Cincinnati (and probably elsewhere, too), fitness clubs over-expanded in the boom years before the crash of '08, and most are desperate for new customers. If the deal they offer you is too expensive, talk them down. It's really doable! 3. If all else fails, exercise inside your own house or apartment. Get free workout DVDs from the library or find exercise shows on cable television. This is not something I've ever had much interest in, but I know people who swear by their own private indoor workouts. A treadmill or elliptical trainer in the basement works for some folks, too. I had a Jazzercise instructor once who used to motivate the class by saying if we work harder we can EAT MORE. She had us trained to call out those last two words in unison. I can think of no better reason to work fitness into my day than that very thing -- now I can EAT MORE. Woo-hoo! 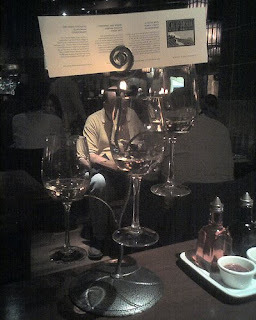 Wine Flights at PF Chang's -- DEAL! I took my mom to lunch at PF Chang's -- had not been in perhaps a year -- and discovered their new-ish deal on wine. Chang's has always had a lot of nice wines by the glass. As with most restaurants, the good stuff is pricey. But here's the thing: you can select any three wines from the extensive by-the-glass list to make up your flight. The official pour is 2.5 ounces, and the price is $9 no matter which wines you select. We were just at 20 Brix, a wine-oriented restaurant in Milford, and their "taste" size is 2 ounces, with prices all over the place--you can easily pay $4-$5 there for one two-ounce pour. I was not intending to have wine at lunch today, but simply could not resist this offer. Furthermore, the bartender was a little generous with those pours--I don't think anyone is back there measuring. I had a marvelous flight of Adelsheim Pinot Gris, Kim Crawford Sauvignon Blanc and Cakebread Cellars Chardonnay ($11 a pop there if you just want a glass of that), served in the cool tower pictured here (not a great photo, though, sorry). Our server said they'd had this deal for almost a year. I say, go for it before someone in top management realizes that this is a bargain for the discerning wine drinker! There sure are a lot of interesting eateries in a two-block stretch of Hamilton Avenue in Northside. Honey is my favorite (and one of the best in the city), but I also like Slim's and Melt, to name the best. This week I finally made it to Sidewinder's Coffee and Tea, a few doors north of the Northside Tavern. The decor and ambiance are just as funky-boho as many of its neighbors. Sidewinder reminds me somewhat of Sitwell's on Ludlow, in that it's a coffee house with a hard-liquor (but no beer and wine) license. My friend and I had a light lunch -- soup of the day and a half sandwich --which we liked. But my treat was a cup of Hot Buttered Rum. Mmm, mmm, that hit the spot! Sidewinder is at 4181 Hamilton Avenue and it's open every day. Just opened Friday 12/4/09: Marty's Hops and Vines on Hamilton Avenue in College Hill. They're serving wine by the glass or bottle, craft beers (in bottles and on tap) as well as light food. 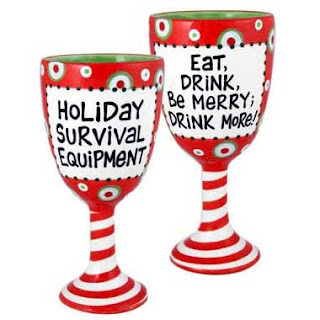 Wine and other items are available to purchase, and if you drink a bottle on the premises you pay the retail price plus a $5 corkage fee. Owners Marty and Kate Weldishofer are longtime College Hill residents and community activists who hope their new venture -- at 6110 Hamilton across the street from College Hill Cafe -- will become a gathering place for the neighborhood. They're open Tuesday - Saturday. For more info, call them at 681-4222. 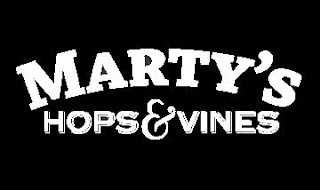 I just heard about Marty's from my friend, Jean Huwer, who owns property in College Hill. Haven't been up there yet, but it sounds like a place worth visiting! Heat the oil in a large skillet over medium-high heat. Add shallot and garlic and cook, stirring, for one minute. Add sausage slices and continue to cook until shallot becomes translucent and sausage begins to brown, about 2-3 minutes. Reduce heat to medium and stir in beans. Add tomatoes, seasonings and broth. Cover and cook for 3 - 5 minutes, until mixture starts to simmer. Stir in spinach, cover and cook another 3-4 minutes. Meanwhile, cook the pasta in a pot of boiling salted water and drain. Add pasta to the skillet. Serve in bowls, passing cheese at the table. This is a complete meal--add crusty whole grain bread and a glass of red wine! Here's a savory (not sweet) bread pudding, something like a very custard-y stuffing. It can be the centerpiece of a vegetarian holiday meal or a dynamite, hearty side dish for a roast. Use good quality whole grain bread, rosemary focaccia or whole wheat sourdough. Place tomatoes in a bowl, cover with boiling water and let stand for 10 minutes. Drain well and finely chop. Heat oil in a small nonstick skillet over medium-low heat. Add garlic; cook for 1 minute, stirring. Beat eggs lightly in a deep bowl; add milk and half & half and mix well. Stir in tomatoes, garlic, 1/2 cup mozzarella, 1 T Parmesan, thyme, salt and pepper. 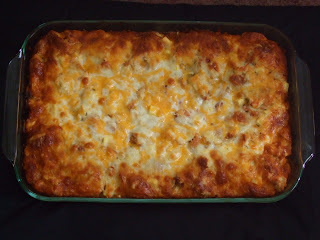 Place bread evenly in a shallow 1 1/2 quart casserole coated with cooking spray. Pour milk mixture over bread, stirring gently to coat. Let mixture stand 10 minutes. I love to make pestos of all kinds, varying the ingredients -- different herbs instead of or along with the traditional basil, various nuts in place of the pine nuts, and so on. This pecan version is a healthy-foodie winner as it has no cheese and less oil than many pesto recipes do. If you have leftover pesto, wrap two-tablespoon portions in plastic wrap and freeze. Defrost and use with pasta, in a salad dressing or even as a sandwich spread. Puree all ingredients except beans in a food processor until smooth. Cook beans in boiling salted water until crisp-tender. Drain and rinse in cold water to stop cooking. Toss beans with one-half of the pesto, or more if you want. Season with salt and pepper, to taste. Whether you're a wine novice or an oenophile, I recommend the restaurant 20 Brix as a marvelous place to learn about and enjoy a huge variety of wines. We tried it for dinner on a Saturday night--reserved well in advance--and the verdict was 8 thumbs up. The place was packed, including the bar and lounge, and everyone seemed in a party mood. For dinner, I had a salad called Autumn on a Plate followed by a pasta fagiole dish--penne or a related noodle with white beans, tomato and locally made mild Italian sausage. 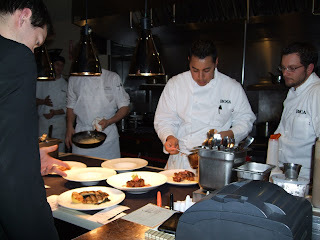 We all liked the food and especially liked how the menu is chosen so that most dishes complement a wide variety of wines. Because here's the thing: everything on the extensive and well-documented wine list can be ordered by the taste (2 ounces), glass (5 ounces) or bottle. We all ordered by the taste -- and the pours seemed more generous than 2 ounces-- and therefore got to try several delicious wines. 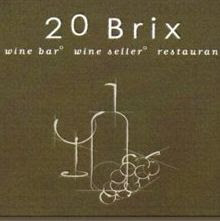 It's 20 miles from our home, and there are plenty of other good restos closer, but we will return to 20 Brix. Check it out! This is a riff on a classic southern Italian combo. I used the relatively hard to find (& expensive) pasta orecchiette, but you could substitute bow-ties (farfalle) or rotini. You could also substitute golden raisins for the harder-to-find currants, but I think the search for currants is worth the effort. 1. Soak the currants in the wine for at least 15 minutes, while you work. 2. In a medium saucepan of boiling, salted water, blanch the cauliflower until fork-tender but still firm, about 3-4 minutes. (Test as you go--it would be bad to overcook the cauliflower at this stage) Drain well. 3. Prepare the pasta according to package directions. Drain pasta and keep warm, reserving 1/2 cup of cooking liquid to add to sauce. 4. In a large skillet, heat oil over medium-high heat. Add garlic and saute for about one minute, until it becomes fragrant. Add blanched cauliflower and stir-fry until it begins to brown, about 3-4 minutes. Reduce heat to medium, add currants with their liquid, crushed red pepper and pine nuts. Cook until heated through, just a few minutes. Add cauliflower and pasta, stirring well. Cover and allow to heat for another couple of minutes. 5. Stir in pasta water and cheese. Taste and add salt, if needed. 6. Remove to a serving bowl or individual plates. Sprinkle with chopped parsley. 7. Serve immediately, and pass more cheese at the table. P.S. 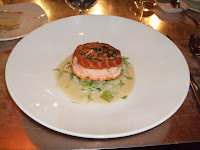 -- My husband loved this dish! Thanksgiving weekend segues into prime shopping/decorating/socializing/travel time. We all run on overload for the next few weeks. How to avoid letting it overwhelm us? Here are a few ideas. 3. Practice patience, kindness and understanding. You can become a little bit of Christmas cheer by cutting the other guys some slack. Make the effort--you'll reap emotional rewards. 4. Take care of yourself--eat right, exercise, minimize caffeine, don't drink too much (despite what my little clip-art above says), and find at least a half hour per day to do nothing.